Aim of the project SmartFactory is to frame the special demands of Product and Process Quality Management of Indusrtie 4.0 in Textile Industry and derive concrete approaches and possible potentials. To do this the current status in Production of Home Textiles with Jacquard Weaving is analyzed by Institute of Textile Technology (ITA) of RWTH Aachen University. As result the typical processes and structures for a Smart Textile Fabric of Future are expected. As shown in the picture the project is divided into two main parallel branches on the mend to Smart Textile Fabric. The first goal is to develop the Smart Weaving Factory. In the smart weaving factory the weaving machines are upgraded to so-called Cyber-physical systems and are able to intelligently interact with their environment. The project is focused on automatic Process and Product Quality Control. 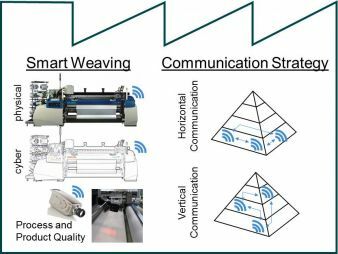 The second goal is to develop a consistent Communication Strategy to link the Production Chain as a basis for the Smart Textile Fabric. To do this an existing strategy from other industrial branches is picked and concretized for a weaving company with an implementation recommendation. It is used as a guideline for further developments and includes vertical and horizontal communication. The project partners thank the Federal Ministry of Education and Research – BMBF for the financial support in this project.